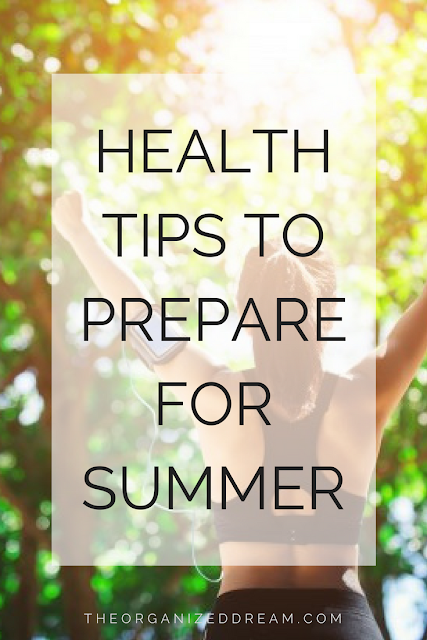 It’s not too late to get ready for the summer; in fact, it’s never too late to take steps to improve your health, whether the summer is coming or in full swing. Feeling fit and well enough to make the most of the summer sunshine will enhance your enjoyment of this most welcome of seasons. It’s the time to get out and have fun, take trips to the beach or the countryside, play with the kids, go on an adventure, or just chill out in your backyard, soaking up those lovely warm rays. It’s easy to hide a few excess pounds under a thick sweater in the winter, but once summer comes you won’t be able to hide – unless you want to stay indoors and miss all the fun! Dieting is never easy, but it does help to have a strong motivation to keep you on track. Looking ahead to how good it would feel to be able to fit into a stylish summer dress or a bikini can be a powerful motivator for many people, and the presence of the sun can inspire you to make an effort. Give yourself a helping hand by choosing a diet that isn’t too hard to stick to, for example, a meal system diet that does all the calorie counting for you and provides all your meals. That way, you don’t have to think about what to have, or work out how many calories you’ve consumed each day, and can leave all the hard work to the suppliers. You can find out more about these types of diets and get special offers from sites like Mighty Diets, who specialize in reviewing different diet solutions. Diet isn’t going to get you in shape on its own. Exercise has several important benefits in addition to keeping you healthy and strong. Using your muscles will tone up your body to give you a firmer, more attractive physique, and of course the more you exercise, the more calories you will burn, which will help you to lose weight more effectively. You don’t have to start going for a five-mile run every morning – in fact, plunging into exercise like that when you’ve not been very active could lead to injury, and will almost certainly be too taxing to keep up. Start with more gentle exercise, such as yoga or Pilates, or book some sessions on the toning tables at the gym. Swimming is another excellent low-impact activity that gives you a whole body work out and is especially good if you have any physical problems, as the water supports your weight, making it easier to exercise. If you want to give the gym a try, start with an introductory program with supervision from the trainers, or employ your own personal trainer if you can. It’s well-known that skin and hair can both suffer from too much exposure to the sun. The heat can cause dryness, so moisturizing your skin and conditioning your hair needs to become a regular habit. The aversion to being out in the sun with pale skin shows no sign of diminishing, but before you rush off to the sunbed for a quick tanning session, or head out to the backyard to get yourself brown before your vacation, think about what is best for your health. Some exposure to the sun’s rays is important for good health and is essential for the production of Vitamin D. feeling the warmth of the sun also makes you feel good and can be a real boost for your mental well-being. However, the sun is like a giant grill in the sky, and if you stay out too long, it will start to affect you negatively. Using high factor sun creams or oils, wearing light, loose clothing, and a hat, and avoiding the hottest times of day are essential if you don’t want to look like you’ve been on the barbecue! Not only is sunburn very painful – it is after all exactly the same as burning yourself on a stove – but you’ll end up with red, peeling skin which is far more unattractive than being a little pale. Continued over-exposure is also a key factor in the aging of the skin, so if you want to avoid the leathery, wrinkled look as you get older, be sensible in the sun. you should also be aware of the risk of melanoma, or skin cancer, from over-exposure, and not take any chances with your health. Sunbeds, when used correctly, will help you avoid getting burnt, but the UV rays used will still contribute to the risk of melanoma. When it’s hot, and when you are doing more, your body loses far more moisture than when it’s cold, and you’re less active. Drinking plenty of fluids is vital to stop you getting dehydrated and suffering the effects of having insufficient water in your body. If you’ve embarked on an exercise regime to get your body ready for the beach, make sure you’re taking enough water on board, or you’ll start to struggle with your exercise. Feeling lightheaded, sleepy, fatigued and having headaches are all indications of dehydration, and the hotter it is, the more likely you are to feel these effects. It’s recommended that between one and a half to two liters of water per day is about right for the average person, but if you are sweating, you will be losing more than normal and need to up your fluid intake accordingly. Summer seems to come and go all too quickly, so avoid missing out and enjoy the warm weather while it lasts. Even if you don’t feel you’ve got the body you dream of, don’t give up – there are all sorts of shapes and sizes of people around, and there’s no reason not to join them. You can still work on reaching your goals over the winter, so you can be ready for the start of next summer!